We were lucky to hear back from one of our customers regarding how much they liked the Drymax Tennis Socks. We know that Thorlo and Feetures are a popular style of tennis sock, but this semi-pro tennis player thought that the Drymax Tennis Socks were the bomb! “These socks are PERFECT for tennis! They are amazing – heads above the other brands. 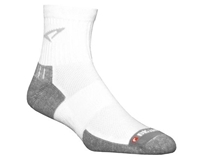 I have worn Thorlos for years, but recently switched to Feetures because the Thorlos are too thick, and would tend to slip when wet, and cause blisters. But the Feetures do get quite wet. Many of the women I compete with have the same complaints about socks. 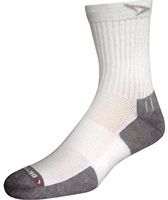 Socks that are functional and take care of your feet are so important – no feet, no tennis! (Kinda like with horses!) Feetures have been promoted at some of the National tournaments where I’ve played. 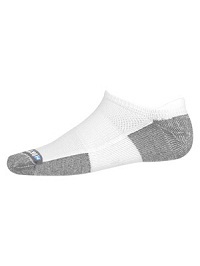 However, your DryMax socks are superior to both these brands — they really work the way they claim — they have the perfect padding and compression for tennis (they don’t slip in the shoe), and they really do stay much drier than any sock I’ve worn. And, the sizing was accurate, and the mini-crew was the right height. 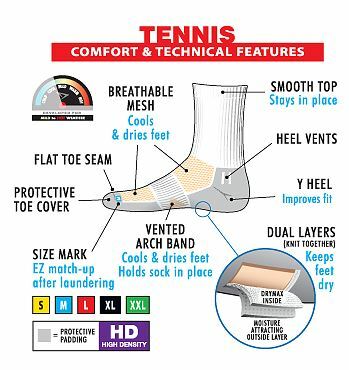 Now I don’t want to wear any of my other socks.” Bonnie T.
Drymax Tennis Socks come in 4 styles/lengths: Crew, 1/4 Crew, Mini Crew and No Show Tab. These things wear like crazy, and they keep your feet dry and blister free while playing your favorite sport.